Now to him who is able to do immeasurably more than all we could ask or imagine, according to his power that is at work within us. So, I've hand lettered this verse on my kitchen chalkboard to remind me multiple times a day what this year is about for me. You see, at first, I thought it was about dreaming all my dreams and then God showing up to make them come true. The truth that God has made very clear to me is this. I am to focus continually and intentionally this year on asking him to give me a bigger understanding about how limitless he is. I am to concentrate on thinking the truest thoughts of who he is and being filled with a sense of wonder about the miracle of the gospel. I am to surrender my thoughts, ideas and dreams to him, exchanging them instead for a deep sense of trust in whatever he has for me. I am to hand him what I have in mind and rest in a deeper understanding and confidence in who he is. And so, I have dug deeper. Prayed more. Refocused my thoughts over and over and over. A funny thing has happened along the way. The more limitless and grand and wonderful that God is to me, the more I feel called to be brave and to jump into endeavors that have felt like too much to me. The truth is that they are too much for me. 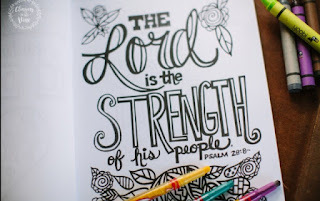 But they aren't too much for a God who is both sovereign and personal. He is a God who is simultaneously omnipotent and intimate in the way he loves us enough to invite each of us in to his plans. Today, I am taking a jump. It's a leap that has felt scary, thrilling, exciting, surreal and awe inspiring. Today, I publicly announce that I have a book. Yes. I have a book with my name on the cover and you can buy it. It's not the book that I've avoided because I couldn't find words and telling my story or any other feels daunting. It's actually a Scripture coloring book, filled with 50 of my hand-drawn Scripture illustrations. It's been a deeply personal project. A labor of love. And a step that I am beyond confident is exactly what I'm supposed to being doing right now. This book has a story all its own that began 38 years ago, when I was a little 7-year-old girl. An avid reader, I began to dream of becoming an author and illustrator. From an early age, I found escape and solace in creative outlets, filling sketch books with doodles and writing stories in my head. Creativity has always been the language of my soul. Two years later, I wrote my first “book” when my Dad was diagnosed with cancer. As he recovered from surgery to successfully remove the cancer, I was too young to visit him in the hospital. So, I began creating daily pages of illustrations and poems to send him. I eventually put my creations together in a three-ring binder that my Dad treasured. Life continued, and my dream was nearly forgotten while I became busy with the tasks of growing up. Then came December 22, 1988. I've learned, like many of you, that sometimes a life-changing event occurs and its impact is so far reaching that you cannot grasp it until it is viewed in hindsight. On that rainy day, another surgery was scheduled to remove another cancer. The prognosis for Dad was good. But, as the surgeon began his work, he found previously undetected liver cancer. We were told three to six months. I was 17 and a senior in high school. I felt numb as I left the hospital to drive home. Suddenly, I was startled to see the most brilliant rainbow spanning the sky. A very certain thought filled my mind – that God would see me through this and would never leave me. As Dad fought another battle with cancer, I created more drawings to encourage him. 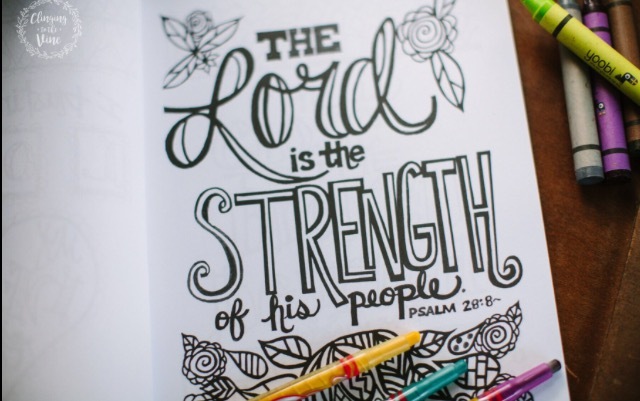 This time, I illustrated Bible verses. Daily at first, I would bring a page for Dad that he would tape to his hospital wall in a collection that filled the room. When I left for college, I mailed a page each week while my Dad’s battle continued. On May 14, 1990, my Dad went home to be with Jesus. I added the second pile of drawings to the original three ring binder. As I have walked through days of grief, I often have thought about writing my story. I even mentally titled the book The Promising Rainbow as a nod to that moment when I felt God’s presence so profoundly. 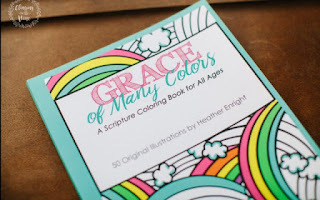 This book of Scripture illustrations is the full circle of hand-drawn pictures from daughter to father. It’s the fruition of the seeds planted from tiny, uncertain offerings in my effort to give back to the Dad who had given me so much. This book is a baby step to tell the story of the Heavenly Father who gave his all to make us his children. He is the Father who paints his promises in the stormiest of skies and pours out grace upon grace. As I edited and refined and perfected the designs for this book, I prayed for wisdom about the whole project. And it blows my mind where God has led me with this book. This isn't just a book for you to enjoy. It's a book that is my come back story. It's a project to redeem and buy back what cancer stole from me -- all the things that I allowed to define and distract me from all the things God intended for me. I'm done being defeated by it. I'm proclaiming the goodness that comes even from loss. So I'm going to use this book for others who are battling cancer. This book is a buy one/give one product. For every book purchased through my Etsy shop using this link, I will give a copy of the book to someone who is fighting cancer. If you purchase the book on Amazon, I will also give a copy to a cancer patient if you contact me with the confirmation of your book order. Listen, for everyone who has a dream buried in doubt and unbelief, I'm telling you to be brave. I'm asking you to go for it. Join me in just taking a step or a leap or a big giant jump. Seek with all your heart to think and believe the truest things about God. Our God is crazy-big and much more limitless than the boxes we create that constrain him. Let's blow those boxes up. Let's blow away our doubts and excuses and just do the things that we cannot shake from our minds. That's what this book is all about for me. And I'm giggling at the next things. Oh, friends. This book is just the very beginning and the first step. I'm already working on the next project. And, I've got a sketch book that I'm doodling in to flesh out a really "NO WAY" idea. I'm asking my "ALWAYS A WAY" God to lead me wherever he wants. Won't you join me in throwing off the obstacles and hindrances and just running? Let's run our races with abandon, using all our talents, time and energy on this earth for the kingdom's sake. May we dare to color outside the lines. If Not, Would I Still Think God is Good?